Three brilliant pedals from one of the world's most influential amp designers - make space on your pedalboard! New, different design. Tank-like construction. Four distinct and excellent tones. Versatility. There are a few sharp edges on the cases. Peeling decals. Awkward battery access. The Stack/Combo switch lets you tailor the bottom-end feel to your liking. You'll get a hefty 60 hours from the battery in this pedal. Best known today for his guitar amps, Paul Rivera's career includes stints with Mesa, Music Man, Yamaha and Fender, where he revitalised that company's flagging amp fortunes with some of the best products ever to roll off the Fullerton production line, including the now legendary Super Champ. Not so well known is that during the late '70s, along with Bob Bradshaw, Rivera was also one of the key innovators responsible for taking the new digital effects of that era out of the studio and building them into racks for many top players, such as Steve Lukather and Lee Ritenour. "It might say 'Blues' on the front panel, but we can see this getting used in all kinds of genres." Fast forward 30-something years and one of 2011's Winter NAMM surprise debuts was a new range of Rivera overdrive pedals - the first since the Buff series three decades ago. All three pedals are built into the same two-piece chassis, which could be mistaken for aluminium, but is in fact precision-stamped and folded 1.5mm stainless steel, with different coloured gloss vinyl stickers on the top and rear surfaces. They look and feel fundamentally substantial - much more so than 'normal' BOSS Compacts and the like - though unfortunately the decal stickers have started peeling a little, which is an issue that needs to be addressed. Inside, the electronics are contained on two densely packed and immaculately finished printed circuit boards, which are through-plated just like Rivera amps to ensure maximum reliability. It's unusual to see this quality of board in a guitar amplifier, let alone a stompbox. Rivera is keen to underline the point: "Our pedals are built like our amps, with top-notch premium hi-fi and military- grade components. "The WIMA condensers that we use are wound, not stacked foil/film like other brands… We also use a lot of discrete low-noise FET and bipolar transistors, along with expensive Analog Devices chips. It's definitely not another 'Bud Box' design!" In terms of practicalities, the reinforced control pots and switches are recessed out of immediate stomping harm's way, and the jacks are on the audience-facing edge. It seems that wherever you put the connections somebody will moan, but these are as practical and compact as we've seen in such well-featured stompers. All three pedals can use a regulated 9V DC supply or an internal PP3 battery, although it isn't easy to get at. You have to remove eight screws. Average current consumption is a frugal 20mA, so depending on battery type, the changes don't have to be frequent; use one of the less well-known lithium CRV9s and you'll get around 60 hours of overdriving pleasure. The controls vary for each pedal. 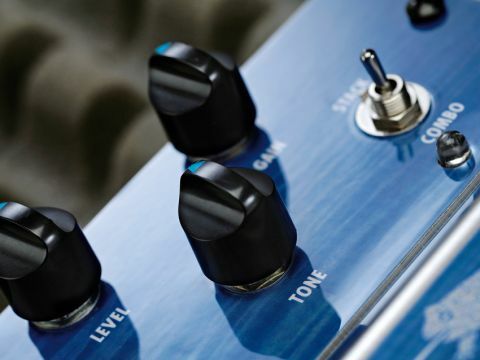 The Blues Shaman has the simplest layout, with knobs for gain, tone and level. There's a stack/combo tone switch and the second footswitch button operates a clean boost function called Ascension. We used a variety of guitars, a Rivera Quiana and a Vox Bruno 1 x 12 to try out the Shaman trio. All three are exceptionally quiet in use. The Blues Shaman has plenty of Fender Tweed- style overdrive on tap if needed, right up to completely crapping-out - albeit with less ultimate compression - to Neil Young-approved levels. Perhaps where it really excels, however, is at lower gain settings, with superb touch-sensitivity and dynamic response, creating a powerful boost that's not completely unlike, dare we say it, the fabled Klon Centaur. Switching between Stack and Combo modes either adds or takes a way a dollop of 4 x 12-style, loose-feeling bottom end resonance, while the boost function kicks it all up that bit higher. It might say 'Blues' on the front panel, but we can see this getting used in all kinds of genres, such is the range of its gain, EQ and level capabilities. It should be said that all three pedals are hugely versatile in terms of EQ, available drive and overall volume on tap. There's a mountain of competition out there today, but very few pedals can match the Shaman range's unique combination of tone, features and uncompromising build quality. Aimed squarely at professionals and well-heeled amateurs, they're versatile without being complicated and intuitively easy to use. Compared to other top-dollar boutique pedals they're priced competitively too; we feel that the extra versatility of the Double Shaman makes it exceptionally good value. Equally important in today's overcrowded pedal market is that they're also very different; with a character and quality that's typically Rivera. With the first and second production runs already completely sold out, it seems the world is catching on fast to the Shamans. The rest of us better join the queue!